The unit supports several aggregation options: 4x100G client in 2x200G DP-16QAM line, 2x100G client in 1x200G DP-16QAM line. Tunable by the wavelength of the laser allows you to organize up to two 200 Gbit/s channels in the C-band in 50 GHz steps. The unit uses the perfect DP-QPSK or DP-16QAM modulation format. 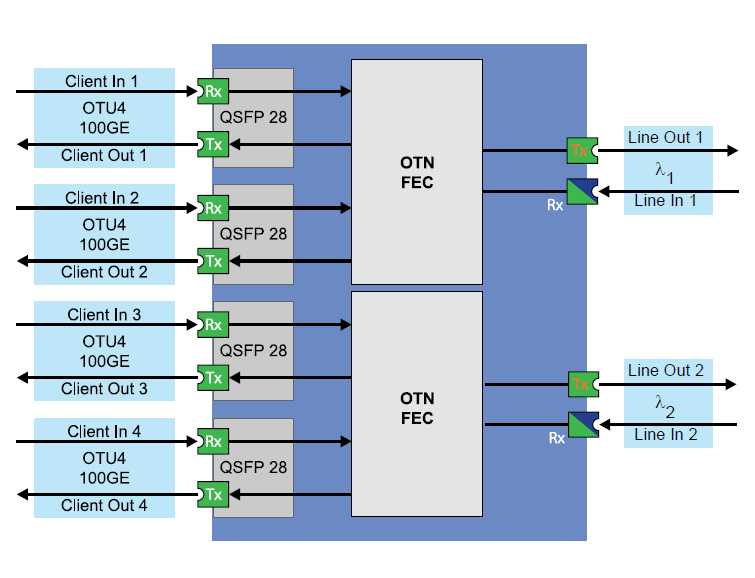 A flexible OTN transmission format is used OTUC2v or OTU4v. The client interface of the unit - QSFP28, which allow to reduces the cost of organizing communication channels.